In some cases, you need to regularly create a full backup. For example, your corporate backup policy may require that you create a full backup on weekend and run incremental backup on work days. To let you conform to these requirements, Veeam Agent for Linux lets you create active full backups. When Veeam Agent for Linux performs active full backup, it produces a full backup file and adds this file to the backup chain. The active full backup resets the backup chain. All incremental backup files use the latest active full backup file as a new starting point. A previously used full backup file and its subsequent incremental backup files remain on the disk. After the last incremental backup file created prior to the active full backup becomes outdated, Veeam Agent for Linux automatically deletes the previous backup chain. To learn more, see Retention Policy for Active Full Backups. You can create active full backups manually or schedule a backup job to create active full backups periodically. To do this, you can use the Veeam Agent for Linux control panel or command line interface. To learn how to configure active full backup schedule and create active full backups with the Veeam Agent for Linux control panel, see Active Full Backup Settings and Starting Backup Job from Control Panel. 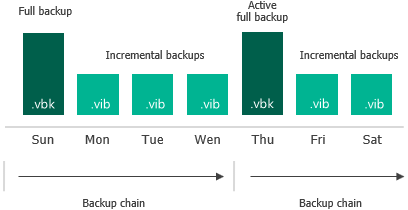 To learn how to configure active full backup schedule and create active full backups with the Veeam Agent for Linux command line interface, see Configuring Active Full Backup Schedule and Creating Active Full Backups. To be able to restore data from a Veeam Agent backup, you need to have a full backup file and a chain of subsequent incremental backup files on the disk. If you delete a full backup file, the whole chain of incremental backup files will become useless. In a similar manner, if you delete any incremental backup file before the point to which you want to roll back, you won’t be able to restore data (since later incremental backup files depend on earlier incremental backup files). For this reason, if you create an active full backup, in some days there will be more restore points on the disk than specified by retention policy settings. Veeam Agent for Linux will remove the full backup chain only after the last incremental backup file in the chain becomes outdated. For example, the retention policy is set to 3 restore points. A full backup file is created on Sunday, incremental backup files are created on Monday and Tuesday, and an active full backup is created on Wednesday. Although the backup chain now contains 4 restore points, Veeam Agent for Linux will not delete the previous backup chain. Veeam Agent for Linux will wait for the next 2 incremental backup files to be created, and only then will delete the whole previous chain, which will happen on Friday. As a result, although the retention policy is set to 3 restore points, the actual number of backup files on the disk will be greater for some time. Veeam Agent for Linux treats the active full backup in the same way as a regular full backup. If some restore point becomes obsolete, Veeam Agent for Linux will re-build the full backup file to include in it data of the incremental backup file that follows the full backup file. After that, Veeam Agent for Linux will remove the earliest incremental backup file from the chain as redundant.